First off, I just want to apologize for the poor quality and the lack of the pictures in this post. I wanted to do a post on a turkey and stuffing in time for Thanksgiving but obviously haven’t made mine for this year, so I had to use mine from last year. I only took a few photos and they were taken on my blackberry’s camera so they’re not great but it’s all I have! This turkey is so easy to make and is great if you’re making a Thanksgiving turkey for the first time! You infuse olive oil with lemon and rosemary, and then brush the turkey with it giving the turkey a really crisp and flavorful skin. The stuffing is a walnut and sage dressing and is absolutely delicious and the gravy uses white wine to give it extra flavor. So put aside all the fears of making a turkey for such an important holiday and get cooking because this recipe is not only easy , it tastes great! After the holiday I will post this years dinner with many more pics and tips! Start by making the stuffing. I forgot to leave the bread out overnight so I just cut 1 loaf of crusty white bread into cubes and dried it out in the oven at 300 degrees for 10 minutes, but I would suggest air drying it overnight. In a large skillet, heat 1 tbsp olive oil over medium-high heat. 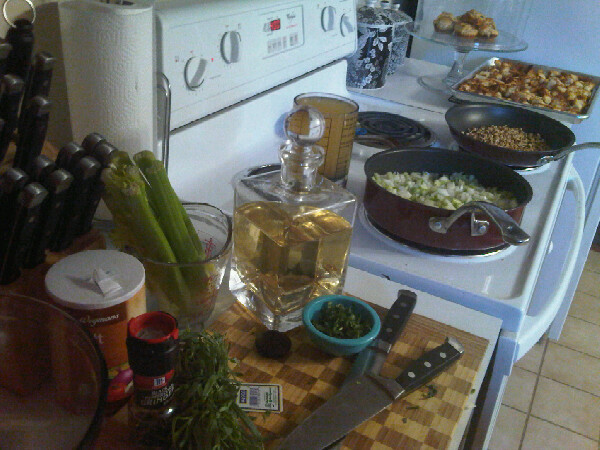 Add 2 large onions (that have been diced) and 2 cups of diced celery stalks, then season with salt and pepper. Cook, stirring occasionally, until vegetables are soft (about 5 minutes) then transfer to a large bowl. Add another tbsp of oil and 2 tbsp freshly chopped sage leaves to the skillet; season with salt and pepper and cook, stirring often for about 5 minutes. Add 1/2 cup sauvignon blanc and cook, stirring and scraping up any browned bits with a wooden spoon, until wine is almost evaporated. Transfer to bowl with vegetables; add 1 cup chopped toasted walnuts, bread, and enough low sodium chicken broth to moisten (stuffing should feel moist but not soggy). Season with salt and pepper and toss to combine. Add 2 large eggs that have been lightly beaten to bread mixture and toss well to combine. Reserve 4 cups stuffing for the turkey. Spoon remaining stuffing into a lightly oiled 2-quart baking dish. Preheat oven to 400 degrees, with rack in upper third. Bake, uncovered, until golden brown on top, 30 minutes. Take a whole turkey (mine was 12 pounds, with the neck and giblets removed) out of the fridge and let it sit at room temperature 30 minutes. Rinse and pat dry with paper towels. Preheat oven to 400 degrees, with rack in lower third. In a small saucepan, heat 3/4 cup extra virgin olive oil, 2 tbsp freshly chopped rosemary, 1 minced garlic clove, and 7 wide strips of lemon zest. Bring to a simmer over medium-high and cook until garlic is soft and lemon is slightly shriveled, 1 minute. Remove rosemary-lemon oil from heat and let cool. Season inside of turkey with salt and pepper. Loosely fill large cavity and neck cavity with stuffing; fold neck skin over opening. You can either tuck the turkeys wing tips underneath body of turkey and the tie legs together with kitchen twine, or you can do a full truss on the turkey which I prefer to do. 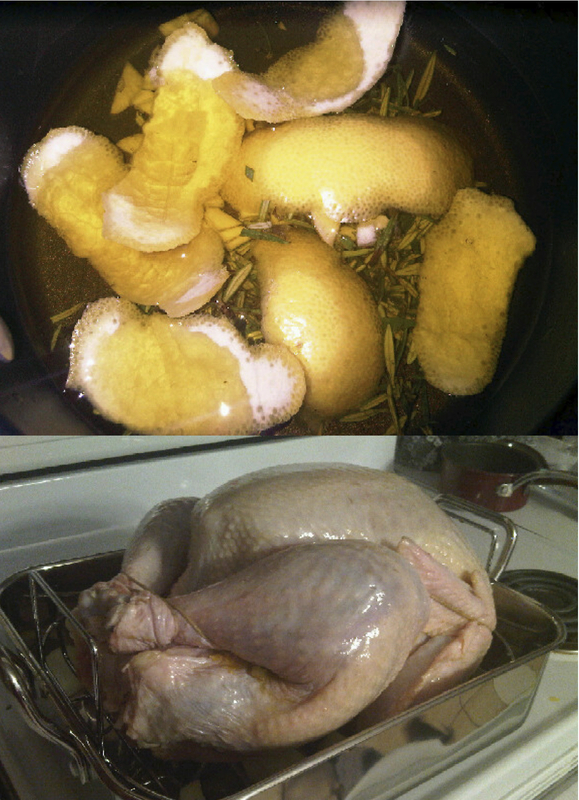 Brush turkey all over with 1/2 cup rosemary-lemon oil and season with salt and pepper. Place 1 large yellow onion that’s been cut into 8 wedges in a heavy-bottomed roasting pan. Set a roasting rack over onion and place turkey on top. Roast until turkey is golden brown, 45 minutes to 1 hour. Reduce heat to 375 degrees, add 1 cup water to pan, and roast, brushing turkey with remaining rosemary oil every 30 minutes, until an instant-read thermometer inserted in thickest part of a thigh reads 165 degrees, 1 1/2 to 2 hours (add some water if pan becomes dry). 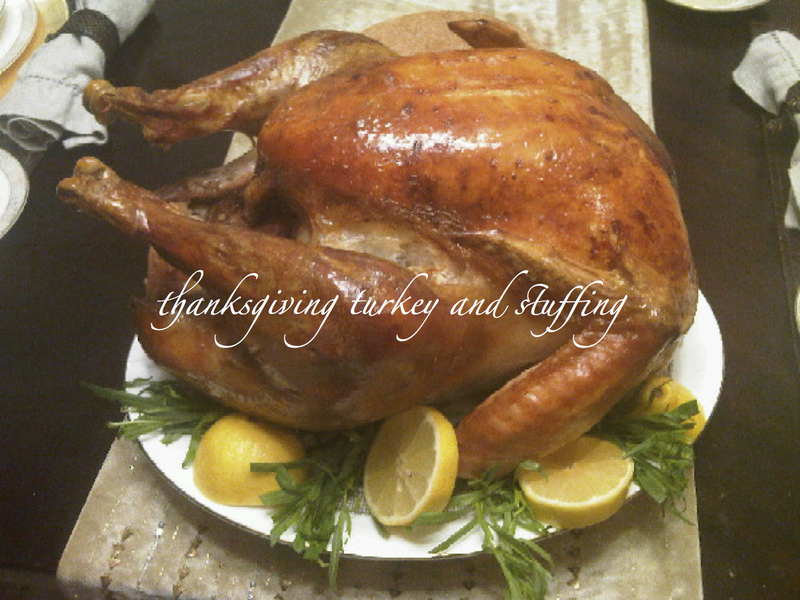 Transfer turkey to a platter or cutting board and loosely tent with foil; let rest 30 minutes before carving. Make sure you reserve the pan drippings for the gravy. Lastly, make the gravy. Pour drippings from pan into fat separator and discard the onion. Set pan across two burners over medium-high heat and add 1 cup sauvignon blanc (or any dry white wine) to deglaze the pan by stirring and scraping up browned bits with a wooden spoon. Cook until mixture thickens and holds a trail (about 4 minutes). Add 1/2 cup all-purpose flour and reserved drippings and whisk to combine, continue whisking until flour is entirely cooked (about 3 minutes). Slowly whisk in 4 cups low-sodium chicken stock and then 1 cup water. Cook and continue whisking until gravy thickens ( about 15 minutes). Season to taste with salt and pepper and keep warm in a gravy boat.